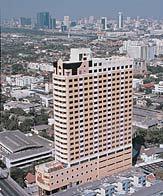 Grand Tower Inn at Rama V1 Road is near near the expressway link system giving rapid entry into Bangkok city centre as well as easy access to the airport. This 24 storey newer urban property is a good home base to explore lively Bangkok known locally as Krung Thep - `The City of Angels`. There are endless bars, pubs, cabarets, shows, multinational restaurants cafes & shopping nearby or short taxi rides away. For sight seeing, don`t miss miss the floating market, Grand Palace, Temple of Recling Buddha-Wat Pho, China- town & Erawan Shrine.